For some time I have been stealing an hour here and there for the rrdf package for R. This package is based on Apache Jena and allows reading and writing of RDF triples, as well as doing local and remote SPARQL querying. BTW, rrdf is not only R package to provide SPARQL functionality, and another package will be demoed at SWAT4LS. So, with a week or so, I used <iframe> in the blog a few times now. The above one is being served by Google Drive. The past few months has seen an increasing paper trail for our Open PHACTS projects. Lot's of cool stuff is ongoing, and more and more is getting openly available. There is a steep learning curve within the project on being Open, and the project makes sure it is done properly. But it takes time. With the Open Standards and Open Source getting out now, I think we have a reasonable start. 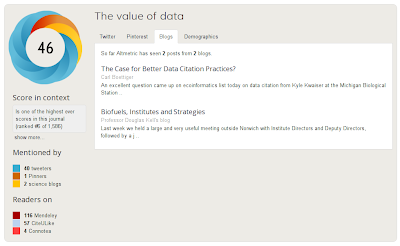 The purpose was to get some #altmetrics on the impact of our project (I blogged about that a year ago). 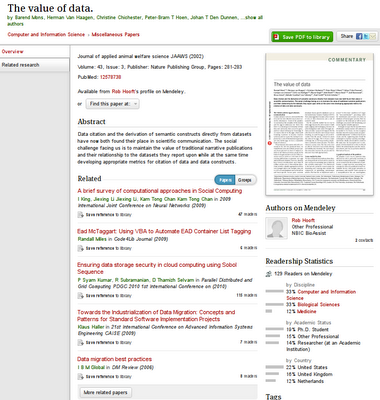 We haven't started tagging the papers, and comments on useful tags are most welcome. 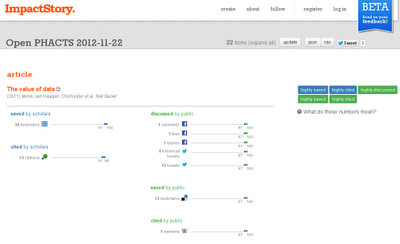 Should we tag with matching Example Application, with consortium partner, both? Something else? Let me know. We can see the paper detail in the middle, and get added value on the right. 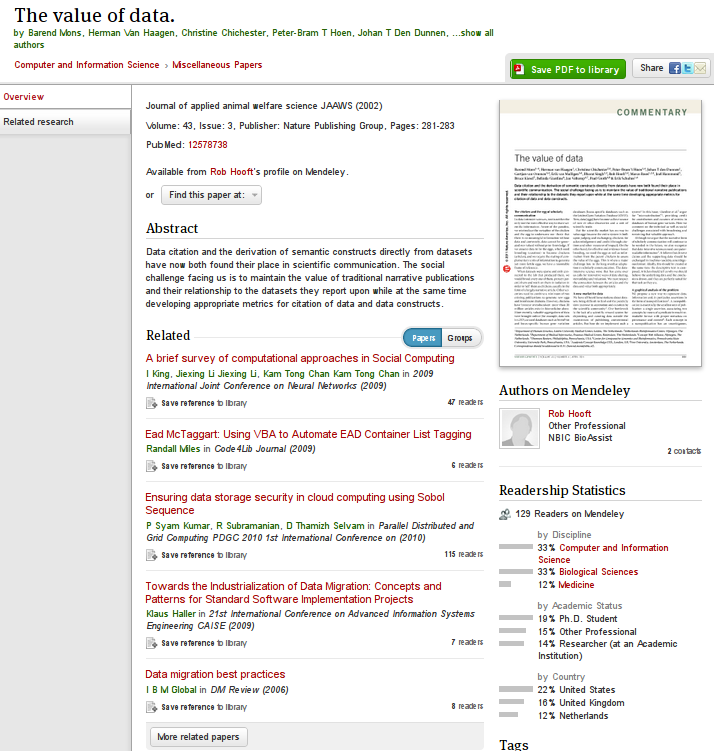 We see a thumbnail of the paper, a list of authors with Mendeley profiles (here only Rob Hooft), and then the reader statistics, and learn that 129 people have taken the time to put this paper in the reference database. 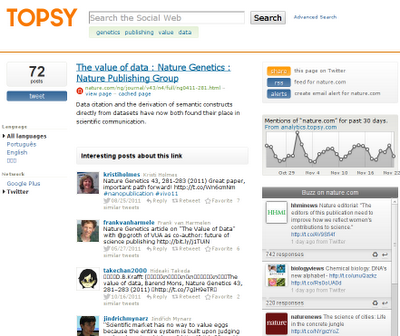 Not just does such #altmetrics give us a number, it actually tells us who, what, why, and how. Much more informative than, let's say, a journal impact factor. This is scientific communication in action. What this page does not tell us, is whether 46 is high, though the page does comment that this paper "is one of the highest ever scores in this journal (ranked #6 of 1,586)". Now, this is a Nature Genetics papers, and more than 1500 Nature Genetics papers got a value, and this paper is ranked #6! Yes, that is impact. We get an detailed of view on where the impact is found, and the percentile information. Here too, we learn that this paper has a relative high impact, compared to peers: it is in the top 3% of papers by impact. Interestingly, the Mendeley reader count was not picked up (update: this was tracked down as a data glitch in the Mendeley database). Mind you, the percentiles for 2012 are not yet available; we have to wait a month or two for those. Once more, this is scientific communication in action! 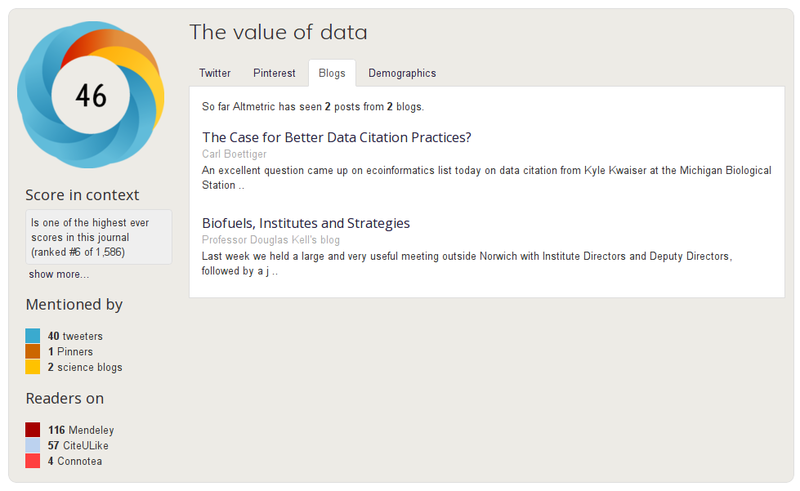 But to do full justice to Euan Adie's altmetric.com work, that side captures the blogosphere pretty well (not suprisingly, given it is Euan). Just check the screenshot above again. One day on, and still struggling with the chemistry behind gene regulation. Let no biologist ever tell me again not to use acronyms (yes, I am looking at you!). But it is interesting. I learned a lot about ChIP, histone modifications, etc, etc. This is an amazing world, where specific histone complex protein residues get methylated, acetylated, citrullinated, and phosphorylated. Of course, all this is in the context of the ENCODE meeting we have tomorrow at BiGCaT, where I will try to cover a paper by Thurman et al. In that paper, Thurman studies the links between DNase I hypersensitive sites (DHSs) and markers of regulation. These DHSs are areas between histones where the DNA is free of histone proteins. There are remarkable images around showing histones as beads on a string, and the distances in nucleotides between histones is in fact not that large. In fact, a histone, despite a large complex, sterically hindering 50% of the DNA access does not stop translation; the transcription complexes apparently have no trouble passing the histones, as described by Felsenfeld et al. Quite amazing! No, it's ChiP. ChIP on a chip, in fact. They have antibodies are stick particularly to a histones with one particular modification. That is how I actually ended up on that Abcam web page in the first place. Check out this nice western blot. With a huge antibody detecting whether there is an acetyl modification. Wicked! Well, earlier I learned that proteins detecting methylated CpG bases not because of the methyl group (which amazed me already), but by a distorted hydration in the major groove due to MeCP2 binding. Seriously! Eat that, organic chemist friends! So, Thurman and friends find distal DHSs and relate these to cis-regulatory elements. To some extend, puzzling, because the above tells us that a lot of regulatory work is happening outside those DHSs. But then again, I did read today about DNA methylation triggering histone modifications. It seems there is so much interactions going on, that it resembles a melting pot. Oh wait, that makes sense; it's one big one pot synthesis anyway. The paper discusses an enormous amount of experimental work, and I cannot seem to be able to make sense of it all. There are striking aspects to it, which I will touch upon momentarily. But I cannot help but mentioning that I am not sure they could either. Their Discussion section leaves something to be desired, like an actual discussion. Instead, they just summarize the paper. They used ChIP with Cell Signaling's 9751 antibody recognizing H3K4me3, with formaldehyde-induced crosslinking. It actually turns out, that the peaks for this modification are right on top of the DNA part from which the transcript is made, in line with Felsenfeld's observation. Upstream of that, where the promotors are expected, that is where DNase I signals are found. That is, I think this means that the DHS upstream of the histone where transcription starts is where the promotor regulation happens. With transcription factors (TFs), of course. And in those DHS regions, that is where DNA methylation happens, and Thurman finds DNA methylation in those regions, inhibiting TFs binding, because the already mentioned MeCP2 already takes that place. Now, then they make a jump from this low level chemistry, to a genome wide landscape. Well, they actually start with that, but as a chemist, I am more of a bottom-up guy (that is an IT method). They report that most DHSs are found in introns and at distal locations. The first is striking: the ratio between intron/exon is >99. Does that imply that exons basically are always DNA wrapped around histones?? Does that actually then tell me that transcription actually sort of requires steric hindrance of the histone?? Ha, those diagrams biologists would be even more misleading that they have been to me (don't ask me how long it took me to learn that there are some 10-40 mitochondria per cell! and I still do not know if all copies in the cell have the same DNA, or if they are more like a population like your microbiome). Now, distal DHSs are the second largest group, and capture some 40-45% of all DHSs. Distal means typically more than 2.5 kb away from the TSS (transcriptional start sites). Most of them are somewhere between 10 and 50 kb away. Now, isn't that something? That is distant indeed! What? Still with me? Let's do some math. It's hard, and I hope to get it right. A human has about 3 billion base pairs (I'll take the WikiPedia count). The paper finds almost 3 million DHSs. That means that the average distance between DHSs is about 1 kb. Compare that to their diagram 1b, outline in the previous paragraph. That means that the DHSs must be very densely placed around the transcribed genes. Indeed, they report ratios of up to and above a 100 fold increase. It must be like that, because otherwise, you cannot get those distances for distal DHSs. Now, another interesting aspect of the paper, is that they find different DHSs for different cell types. That, in fact, increases the average distance between DHSs: those 3 million they find is for 125 cell lines, and more DHSs are found in less then 20 cell lines. Only promotor-related DHSs seem to be more persistent between cell lines. This implies that different cell lines, have different genes unfolded in nucleosome/DHS rich areas (defining the chromatin accessibility), triggering different gene expression. That all makes sense, and rather existing too. As such, it seems to me that this map effectively gives a predictive model, indicating which genes are expressed in which cell types. A further question they ask is if DNA (not histone) methylation is the cause of the result of DHSs. The confirm earlier found correlation between DNA methylation and gene silencing. They basically question if the things like MeCP2 binding happen because no transcription factor is in the way, or that TF cannot bind because MeCP2 is there. Chemically, these are perhaps equivalent: they have competing binding affinities. Except that the methylation must happen at some point too. The suggest that that may be due DNA getting randomly methylated, perhaps not unlike passive demethylation. Chemically, that does not make sense to. I would guess there are many chemical species in the cell that would get more easily methylated... They believe to have found evidence for passive deposition, but also find positive correlation between methylation and gene expression. I would say, the answer is still out there. OK, that's about how far I got now. The last two pages I have to read again, and see what papers I need to read to make sense of that. And I will try to see what others have been saying about this paper. 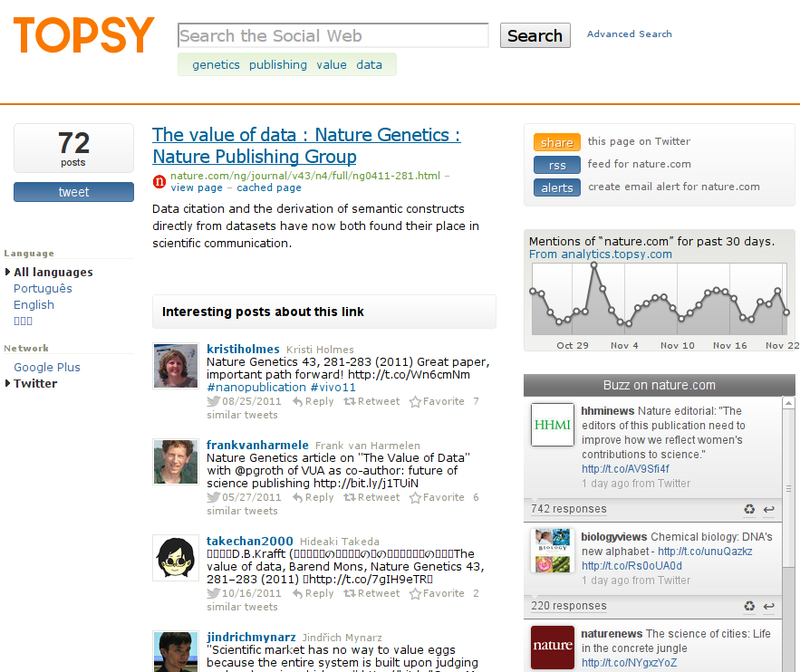 One hooray for #altmetrics! I have started learning about epigenetics, and particularly the regulatory effects of DNA methylation and histone acetylation. It's cool, it's hot, it's everything we hope will explain genetics, because genes certainly did not. The chemistry behind this involves interesting pathways, involves storage of information that passes from one generation to another... epigenetic effects down to the grandchild generation have repeatedly been shown now. I likely candidate are mRNAs that persist beyond the cell division, which trigger modifications again. Well, that is cool chemistry indeed! So, the chemist in me asks: so where are residues actually methylated then? I am learning here, and trying to get the facts together. But, the bases seem to be one place, blocking interactions with DNA-binding proteins which can show beautiful residue/base pair interactions at the sides of the bases. Second year students at Maastricht University in Biomedical Sciences had this as part of their practical last year. The page on WikiPathways is not complete yet, but I haven't completed reading the full paper yet. I wonder how many of these pathways are known. Do you know one? Leave a DOI/PubMed ID in the comments, or add the pathway to WikiPathways yourself. At some point I had thought that I could finally concentrate on master. We have enough regressions there, of various kinds, some 40-50 unit tests that did pass properly in the past. Various core changes that increase the accuracy of our library have the nasty side effect that they uncover certain assumptions. But let's not talk about master yet, and focus on the 1.4.15 release (download here). Unlike I had hoped, a lot changed since the 1.4.14 release. On the bright side, CDK 1.4 is getting more and more reliable with every minor release. Other new functionality include an alternative aromaticity checker, which is happy to mark rings aromatic even if the ring has double bonds pointing outside the ring (e.g. benzoquinone). That means, we now how two algorithms in the CDK to perceive aromaticity. Otherwise, there is a truck load of fixes. One really important one, is the fix that ensures that stereochemistry is also cloned(). Other fixing include minor atom typing work, including new selenium atom types, the further generalization of the IO accepts() methods, and a fix in the SDG code to not delete bridging hydrogens before doing structure clean up. There are many more small fixes and tunes, and as always, the full list is given below. I already mentioned this ENCODE discuthon we have next week. As I have to discuss stuff about hypersensitive DNA regions, I have to seriously brush up my biology. Brush up?? That suggests there was a decent basis. Well, think again. I though history was much more interesting! I am a chemist. When people talk about the DNA in the cell, I always considered a single molecule. Until I learned there are 46 chromosomes. So, each cell actually has 92 DNA molecules. That was a revelation I had somewhere in my second or third year at the university. Remember, I did not have biology in secondary school. So, I just ran into this way cool figure from the Three-Dimensional Maps of All Chromosomes in Human Male Fibroblast Nuclei and Prometaphase Rosettes paper by Bolzer et al. (doi:10.1371/journal.pbio.0030157). I actually ran into the WikiPedia version of it, in the chromosome article. It's an adaption, but the original is much better even. I can just wish they had added a Jmol applet with the 3D rods, rather than these static images. The CDK has been using PMD for quite a while yet, but there is another tool, called FindBugs. I had seen this before, but until I watched two Java Puzzler videos John sent me (here is one), I had not used that much. 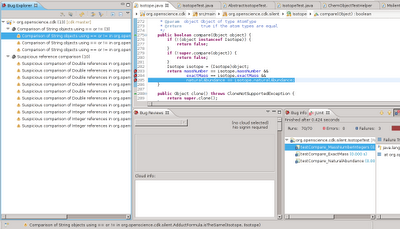 There is a nice Eclipse plugin, and you can run it on any Java package. Thirteen possible problems! I mean, seriously, this is the core of the CDK! The tests are filed as patch here. Since some time I have been member of the Open Science working group of the Open Knowledge Foundation. As such, I organized lunch meetings in Stockholm about Open Science (join this mailing list) and participated in working group efforts, such is running Is It Open Data (RIP) on the HCLS LODD data sets (many of them turned out to not be Open at all). Also, I love to have Open Science lunch meetings in Maastricht (and/or in Eindhoven), and if you do too, join this mailing list. science and scientific research outputs. Really, there is really a lot you have to do, and as Peter Murray-Rust replied to Jenny's call, you do not have to be paid as scientist to join! What online services support InChI and REST? The adoption if InChI is increasing, despite its limitations. But one thing I find greatly missing, is chemical databases supporting access of entries via the appropriate InChI. I know there are resolvers around, but that is different. They do a search, and give me multiple links to individual structures that may match to a certain extend. I am not interested in that in this context. What I want instead is to be able to deep link to a particular entry in ChemSpider, PubChem, HMDB, or whatever databases using the InChI instead. 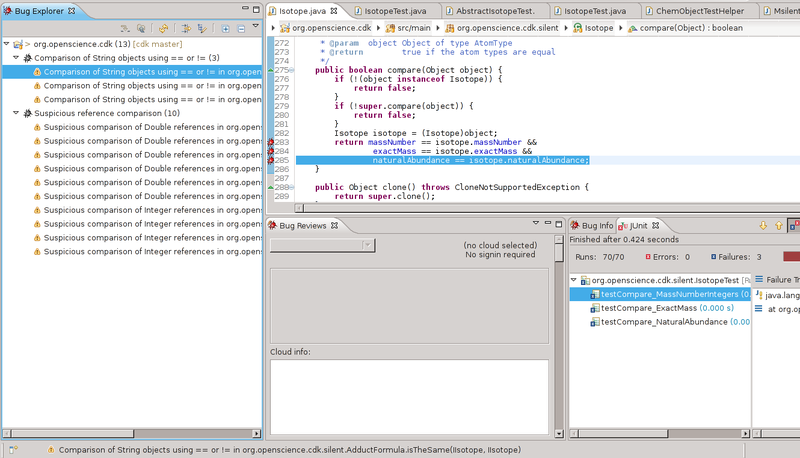 The only service currently supporting this that I am aware of, is rdf.openmolecules.net. It uses a URI pattern like http://rdf.openmolecules.net/?$INCHI. For example, the entry for methane is http://rdf.openmolecules.net/?InChI=1/CH4/h1H4 and this URI deep links to the entry of methane, rather than a search result list. So, the core requirement is that the database URI tells me, either: "yes, this is the one and only entry matching 100% this InChI", or "no, I do not have data for this structure". What other databases support deep linking using the InChI? And what would the URI look like?